John Lennon would be 76 years old today. I have always wanted to make a 60s and Beatles inspired music corner and eventually got round to finishing it today. Although I think music corner generally refers to a place with music instruments, I envisaged a Beatles fan's own place in the house, where he keeps his vinyl collection and other Beatles merchandise. This is also the place where he retreats to unwind after a long day. Mid-century music boxes and sideboards have always fascianted me, so that was the starting point for this moodboard. As these are low cabinets, there is huge wallspace above them offering many possibilities to decorate. 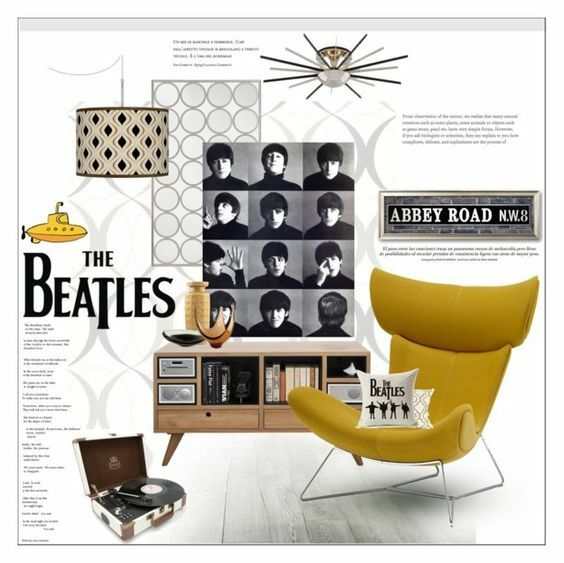 I chose a Beatles poster and a light coloured retro wallpaper. If the wallpaper had brighter colours, I would not use this poster, but the colour palette is very muted and balanced, so it looks good. Notice how the lampshade brings back the wallpaper motif, and also the square shape of the photos appears on the sideboard. Yellow ochre is a great retro colour, that is why the modern armchair matches the environment. The yellow vase and retro bowl bring back the colour of the chair, and also provide and accent hue. The overall colour scheme would not look out of context in a Scandinavian setting, but the patterns bring it back to mid-century. Even the fan ceiling light is atomic age inspired, too. I included a briefcase-style record player, because vinyl is back, too! How to decorate a Dorm Room?